Former Florida Gov. Jeb Bush joked that his mother called her style of raising him and his siblings "'a benevolent dictatorship' — but honestly, it wasn't always benevolent." She was widely admired for her plainspoken style during her husband George H.W. Bush's presidency and was known as "The Enforcer" in her high-powered family. Jeb Bush said he could feel her presence Saturday inside the nation's largest Episcopal church and that she would likely have given him advice: "Jeb, keep it short. Don't drag this out," he said to chuckles. He met her expectations with a speech lasting about seven minutes. He choked up at one point while addressing the roughly 1,500 people seated inside St. Martin's Episcopal Church, where his parents regularly worshipped, when saying his mother — known for her self-deprecating remarks about her wrinkles and white-gray hair — was "beautiful" until the very end. 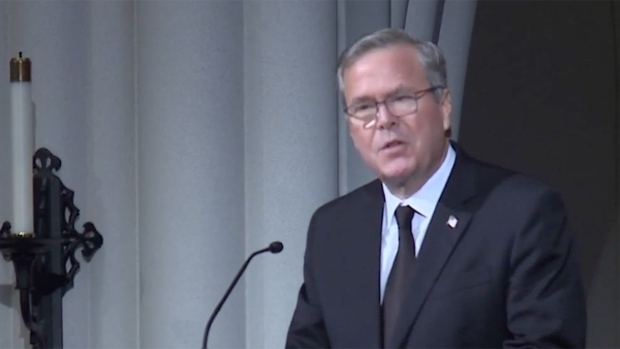 Jeb Bush eulogized his mother, former first lady Barbara Bush, at her private funeral April 21. He read a wedding anniversary letter his father, former President George H.W. Bush, wrote to her. His father, a prolific writer of love letters to his wife, laughed when his son read a letter from their wedding anniversary in 1994. It began: "Will you marry me? Oops! I forgot we did that, 49 years ago." But when his son continued reading, about how his father grew happier each year spent with his wife, his father closed his eyes and cried. Jeb Bush later hugged his father and kissed him on the cheek. Presidential historian Jon Meacham, who wrote a 2015 biography on the former president, recalled during his eulogy Barbara Bush's devotion to her husband of 73 years, noting he was the "only boy she ever kissed." Theirs was the longest marriage of any presidential couple. Meacham said Barbara Bush was also known for bringing awareness to AIDS patients and for her work promoting literacy , which her husband subtly honored Saturday by wearing socks printed with blue, red and yellow books. "Barbara Bush was the first lady of the Greatest Generation," Meacham said, a nod to the generation that fought in World War II. The couple's family, including their five children, 17 grandchildren and seven great-grandchildren, played prominent roles in the service. Granddaughters offered readings, some of their voices shaky with emotion, while their eight grandsons were pallbearers. The Bush family was seated in front of the church. Nearby, two other former presidents — Bill Clinton and Barack Obama — along with their wives and current first lady Melania Trump were seated in the same pew. A eulogy was also given by Barbara Bush's longtime friend, Susan Baker, wife of former Secretary of State James A. Baker III. She said Bush — the wife of the nation's 41st president and mother of the 43rd — was "the secret sauce of this extraordinary family." As the funeral ended, George H.W. Bush was pushed in his wheelchair by another son, former President George W. Bush, as they followed the casket out of the church's cavernous sanctuary, which had been adorned with sprays of yellow garden roses, yellow snap dragons and antique hydrangeas. They stopped along the way to shake hands as mourners sang "Joyful, joyful, we adore thee," which Barbara Bush had requested as the final song. She died on Tuesday, with her husband by her side, at their home in Houston. She was 92. Barbara Bush was buried Saturday afternoon at her husband's presidential library at Texas A&M University in College Station, about 100 miles northwest of Houston. The burial site is in a gated plot surrounded by trees and near a creek where the couple's 3-year-old daughter Robin is buried. She died of leukemia in 1953. "It was a very brief but poignant and beautiful ending to a very moving and incredible day. 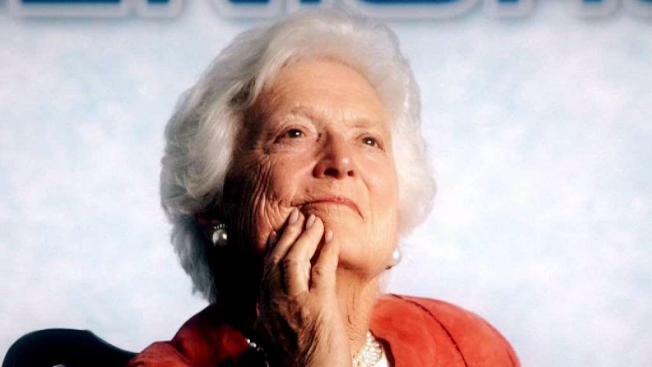 It would have been exactly what Barbara Bush wanted," family spokesman Jim McGrath said. Hundreds of people lined both sides of the street near the campus as the funeral procession passed on a gray, cloudy day. Flags were flown at half-mast. Other guests at the invitation-only funeral included former Rep. Gabby Giffords and her husband, retired astronaut Mark Kelly, and professional golfer Phil Mickelson, along with Karl Rove and other former White House staff members. Melania Trump said in a statement it was an honor to give her respects to a "fearless" first lady, adding: "Today the world paid tribute to a woman of indisputable character and grace." President Donald Trump didn't attend to avoid security disruptions, according to the White House, but he released a statement saying his thoughts were with the family. Former President Jimmy Carter and his wife, Rosalynn, also didn't attend because he was traveling overseas and she was recovering from surgery, according to the Carter Center. On Friday, more than 6,200 people visited the Houston church during a public viewing. Many of the women wore the former first lady's favorite color, blue, and her trademark pearl necklaces. George H.W. Bush was so moved by how many people lined up Friday to pay their final respects to his wife that he decided to go . From his wheelchair, he spent about 15 minutes shaking hands with people who had come. Associated Press journalists John L. Mone and Mark Humphrey in College Station, Texas, and Julie Watson in San Diego, contributed to this report.